Serenade for Sophia was written to celebrate the birth of my first grandchild, Sophia Isobel, and is dedicated to her with love. The work is scored for double wind quintet with no doublings, and begins with a short formal Intrada. This word, derived from the Spanish “entrada”, is defined in Grove’s Dictionary as “an instrumental piece, generally for an ensemble, to accompany an entrance or to inaugurate some festive event”. This, to me, perfectly sums up the happy event of Sophia’s arrival. The movement is a formal A-B-A structure with the flutes having a decorative function in the A section, a melodic one in the middle section, and a more florid role in the reprise. The main theme of the Dance is initially stated by the first bassoon, before being taken up by the upper woodwind, in melodic and friendly music that hints at warmer climates, and taps into the rich culture of Sophia’s Jamaican relations. The Finale is the longest movement, and plays on the juxtaposition of two contrasted moods: firstly a reflective, somewhat troubled idea, characterised by an upward rising minor-mode four-note scale, rhythmical horn pedal notes and gritty passages in thirds for clarinets and bassoons. The mood then shifts, a key centre is established, and the sun comes out in a happy Allegretto passage. This process is redeveloped: the reflective mood becomes more espressivo and is treated canonically, the sun once again breaks through the clouds, and shines even more brightly in a joyous coda. The work was commissioned by the BASBWE Education Trust on behalf of the College Commission Consortium with financial support from the Performing Right Society Foundation. The BASBWE Education Trust on behalf of the College Commission Consortium 2001, comprising of the Birmingham Conservatoire, the Guildhall School of Music & Drama, the London College of Music & Media, the Royal College of Music, the Royal Northern College of Music and the Welsh College of Music & Drama. The BASBWE Education Trust gratefully acknowledges financial support from the Performing Right Society Foundation. 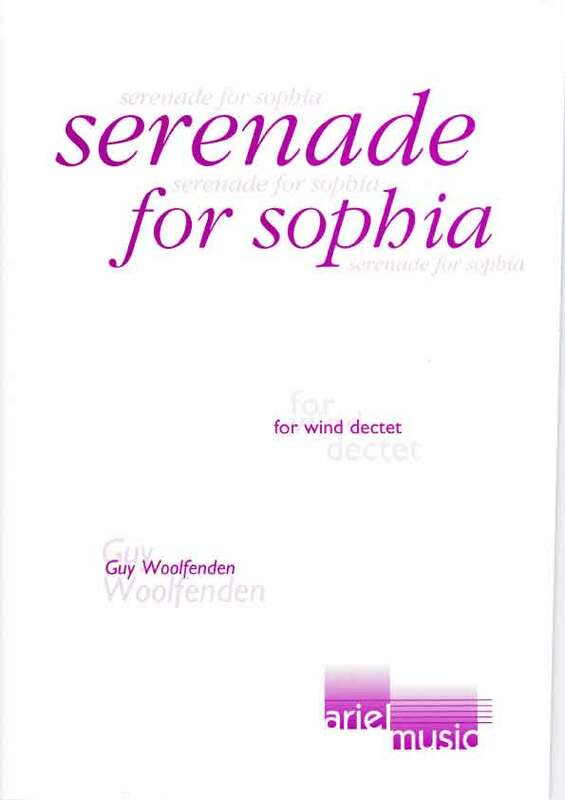 Guy Woolfenden’s Serenade for Sophia was charming. The majestic pomp of the Intrada provided the perfect foil for relaxed Jamaican style rhythms in the Dance and the contemplative mood, which began the Finale, was gradually shaken off to end on an optimistic note.